Qatar have retained their Asia West title in Doha, beating Lebanon and Jordan - the latter making their international debut. 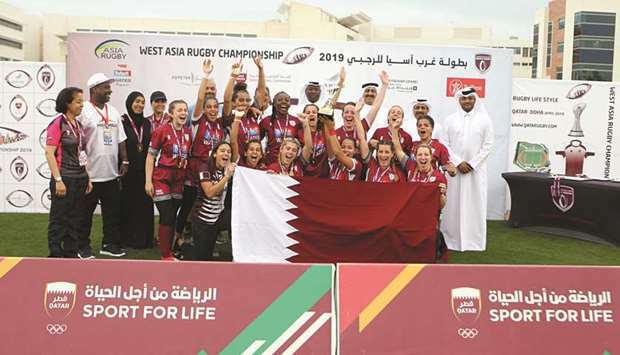 Qatar put up a dominant performance to retain the Asia Rugby West Women’s Sevens title with an impressive 22-5 victory over Lebanon. The hosts also celebrated a third place finish for the Qatar B team, after they beat Jordan 27-5 in the third-place playoff. Last year, the Qatari women had won the title in Lebanon. Qatar Rugby Federation president Yousef Jeham al-Kuwari crowned the winners at the end of the tournament in the presence of secretary-general Abdullah al-Khater, public relations manager Issa al-Yaqoub and national teams manager Hamad al-Abdullah. Qatar was dominant throughout the tournament picking up a 39-0 win over Jordan in their opening match, before going past Qatar B 21-5 and ending the first day of the competition on Thursday with a 26-0 win over Lebanon. Qatar B picked up thrilling wins over Lebanon (15-12) and Jordan (20-10) on Thursday. Yesterday, in the semi-finals, Qatar beat Jordan 34-0 for a spot in the final, while Qatar B missed out after Lebanon edged them out 17-15. Qatar’s Yasmin al-Dahabi was adjudged the best player of the tournament. Team manager Heba Mohamed Ali praised the level shown by the players for the second straight year. “We thank the Federation for their support and we are very happy. Our team proved their capability to compete with some strong outfits and we are now waiting for the Asian Championship in Jakarta,” she said. Qatar Rugby Federation president Yousef Jeham al-Kuwari was understandably ecstatic. “We have the best team in West Asia and among the Arab countries. We have been unbeaten in the two editions,” he said. “We have a great base in women’s rugby and we also saw our ‘B’ team finish third, and it was close to qualifying for the final,” he said. Al-Kuwari said that the Asian federation has praised the organisational level of the tournament and offered us to submit a bid to host the 2022 World Cup Rugby Sevens. He also thanked Aspire for their support for the tournament.